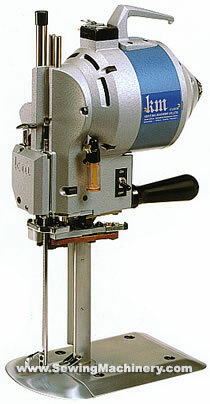 The KM KS AUV straight knife cloth cutting machine has been in service for many years. It is one of the most popular Japanese made cutting machines in use with the Textile & Garment Industry. It is a general purpose cloth cutting machine suitable for cutting many types of fabrics. Originally developed industrial motor for a smooth cutting operation with good cutting power and a lower operating temperature. Automatic oil lubrication device with oil supplied automatically from the central reservoir to the guides and cross head assembly. Automatic blade sharpening device which uses inexpensive emery bands. 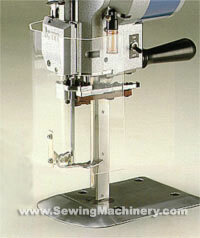 Just press the sharpening lever and the blade is sharpened automatically in a single operation. Low profile base plate with smooth surface to reduce friction and allow material to pass easily.